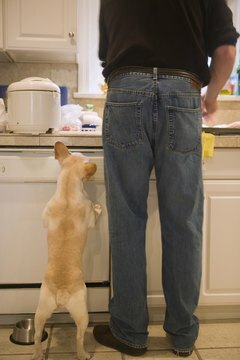 Shaking a can of pennies at your dog as he jumps up can startle and distract him. Your dog's behavior drives you crazy. Whether it's jumping on people, cruising counter tops, stealing food or barking incessantly, it needs to stop -- now. An easy training tool to use is a noisemaker; a simple gadget that provides a sudden, sharp sound to distract him and halt the behavior. Make this training tool easily at home. Fill a metal soda or coffee can with a handful of pennies, marbles or bolts. Place the lid or a piece of tape over the opening to keep the contents inside. When your dog engages in an undesired behavior, shake the can hard once to startle your dog. Add a firm "no." When he repeats the behavior, shake the can again. Use this tool consistently to help your dog associate the noise with the action, so he learns to avoid the action. Use what is available around the house to provide a sudden, startling noise to halt your dog's behavior. Toss a heavy book or boot on the floor. Bang a pot with a metal spoon or the lid. Or slam a cupboard door or drawer suddenly. The key is consistency; your dog should believe that noise is coming every time he engages in the unwanted behavior. Stop your dog's bad behavior with a whistle. Purchase an inexpensive whistle at a toy or sports equipment store. Wear it around your neck and blow it at him when he engages in poor behavior. You can also use it as a deterrent for other dogs in the neighborhood who may bark at or charge you when you are outside. Specialized dog whistles are also available. These emit a high frequency pitch that humans typically cannot hear and are used as a training device, either to train a dog to follow a command, or to stop an undesirable behavior. Clicker training is used to stop a bad behavior by reinforcing a good behavior in its place. Dogs are not startled by a clicker -- it's not loud enough. However, if your dog barks incessantly, you can use a clicker to teach him to be quiet on command, or with the simple wave of a hand. When he barks, activate the clicker, say "Quiet!" and give him a treat. After repetitions of this exercise, he will associate the word "quiet" with a treat, or the clicker itself with a treat. Clickers can be used to stop numerous bad behaviors in a dog, and are small enough to fit inside a pocket. Why Do Dogs Scratch the Ground After Defecating? Do Different Types of Music Affect a Dog's Behavior? How Long Can a Dog Be Punished After Bad Behavior?